I started following a local blog, Two Birds, recently. They do something fun called Inspiration Monday and I decided to play along this week! It was warm on Saturday, so it seemed like a good time to try this out. I had the perfect jeans and then I remembered this tank top I got from my cousin's bag of goodies awhile back. When I bought the blazer I have on from Forever 21, they had it paired with a bright colored tank like this. The hardest part of recreating this look was in the scarf - I don't have a ton of scarves and the ones I have I usually use as head scarves. I'm trying to get more into the scarf trend. I have a hard time with tight things around my neck, but I think the right scarves tied loosely enough should work. Anyway, I think this one did all right for me! Topped it all off with my famed "suicide" shoes because while it was warm, I wasn't going to drag out sandals for one day. I thought these looked nice enough though and similar to the sandals Kelly Ripa is wearing in her picture. The Pants Monkey thought this made a pretty nice outfit actually, so I wore it out on our "date night" on Saturday. How do you think I did? For more Kelly Ripa inspired outfits or to add your own, visit the fabulous ladies at Two Birds. 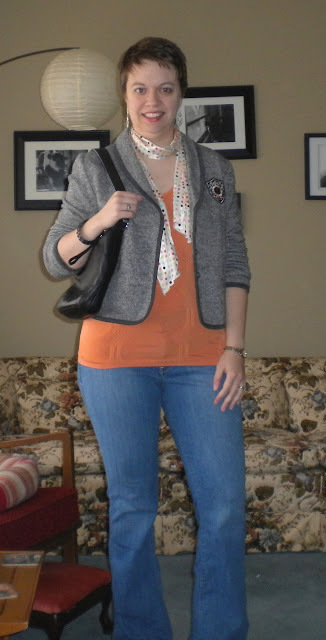 i love that blazer paired with the orange top! and the scarf definitely works! i own a zillion scarves and don't wear them enough! Love the outfit! I'm really liking scarves right now and I don't own enough of them in my opinion! Love your outfit! The orange and grey go so well together! The polka dot scarf is cool. I'd like to find some smaller scarfs light weight like yours, mine are mostly large and bulkier. Those jeans are so great, they fit you so perfectly! Your blazer is super cute too, I can't wait until Forever 21 opens in my town. It's going up at the mall now! Cute job on the outfit! I like that your interpretation is your own. I also enjoy that your bracelet is from Charming Charlies. We just got a few of those stores in San Diego. What a fun place to shop! The orange top looks great on you. LOVE your blazer! It looks great paired with the orange. Scarves are a great way to add to your clothing arsenal without spending a ton of money. We get ours at thrift stores. Hey Bethie-Boo! Thanks so much for letting me know who Kelly is! I really like your look! That blazer is so cute with the old English schoolboy look about it!! Great interpretation. Sometimes inspiration doesn't have to be a direct copy, but a fab synthesis of a look. I think you did a great job. Love that scarf. You look so pulled together. And you are right that is the point of the exercise.